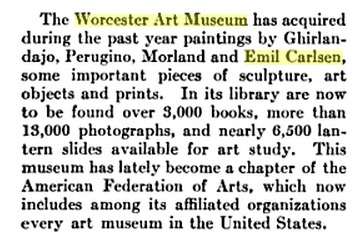 The Worcester Art Museum has acquired during the past year paintings by Ghirlandajo, Perugino, Morland and Emil Carlsen, some important pieces of sculpture, art objects and prints. In its library are now to be found over 3,000 books, more than 13,000 photographs, and nearly 6,500 lantern slides available for art study. This museum has lately become a chapter of the American Federation of Arts, which now includes among its affiliated organizations every art museum in the United States.